A new year, and yet more new talent from the Traum house of quality. 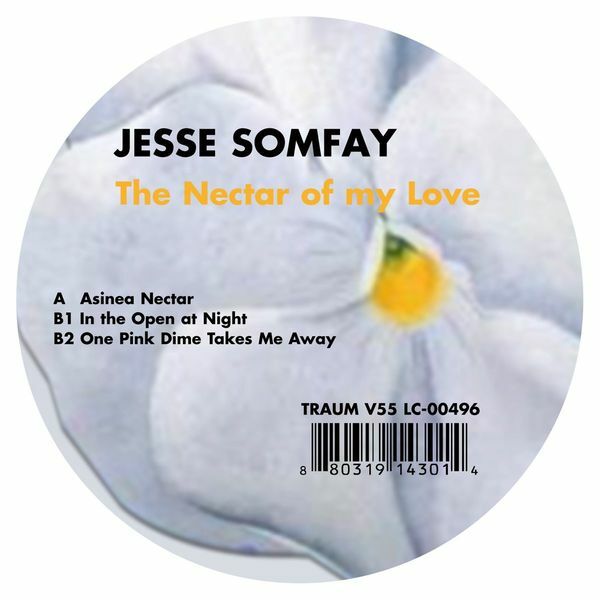 Jesse Somfay conjures with some killer bassline business here – ‘Asinea Nectar’ sets out in forthright fashion, super chunky bottom end guaranteeing some dancefloor mayhem and well configured drums propelling the tune in telling fashion. The right chords lay naturally on top, and this record seems to suggest a way for techno – employing classic techniques but with a mighty, souped up impact. Tuffest sound for playing very very loud. ‘In the open at night’ is extremely consistent too, nicely reduced for the early hours crew yet somehow managing to work up and in to a delicious peak. ‘One pink dime takes me away’ again wields a huge low end, crisp hats and a shuddering, breathtaking sense of dubby open spaces. Thre very big tunes – wicked twelve.